There’s a lady in our church that makes the best chocolate eclair dessert. 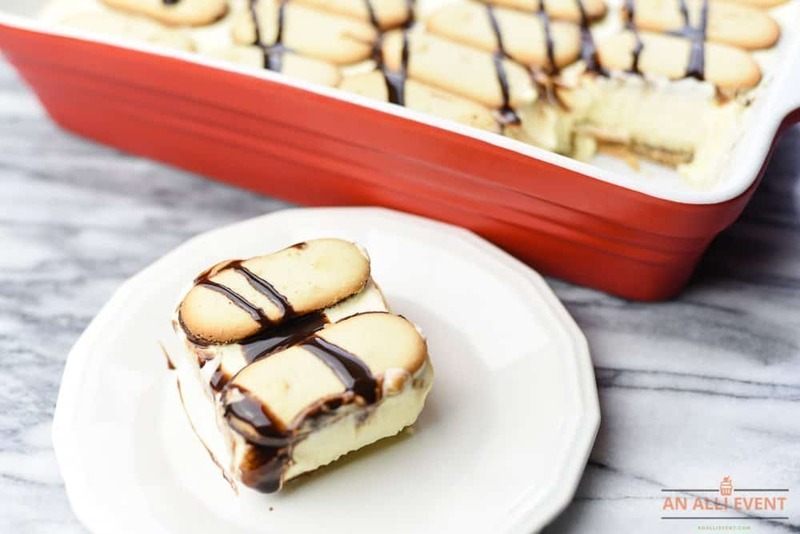 It’s made with layers of graham crackers, creamy vanilla pudding, and topped with a homemade chocolate icing that hardens as it sits in the fridge. It’s amazing. Every time I make this dessert, it disappears in a hurry. This past weekend, I decided to mix things up a bit. I’m crazy about Pepperidge Farm Milano Cookies. I’m partial to milk chocolate, but you can replace them with the dark chocolate cookies in this recipe if dark chocolate is your thing. That’s how my Milano Chocolate Eclair Dessert came into being. And I have to tell you, it’s a huge hit. For my version, I replaced the graham crackers with the Milano cookies. I didn’t make as many layers and I nixed the homemade chocolate topping and replaced it with a drizzle of chocolate syrup. Yum! 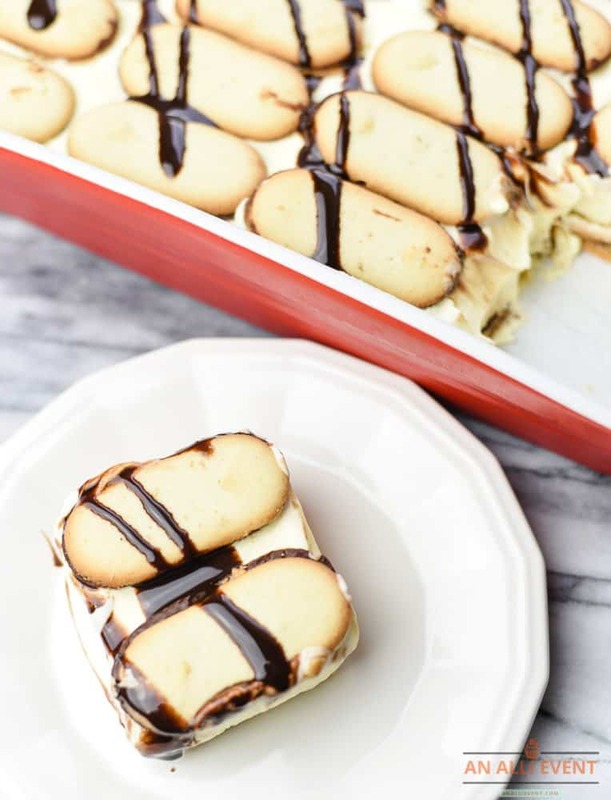 My Milano Chocolate Eclair Dessert is the perfect dessert for Sunday lunch. I make it the night before and store in the fridge overnight. You will need four packs of Milano milk (or dark) chocolate cookies. It may sound like a lot, but these cookies come in very small packages. Mix together a large package of instant vanilla pudding and 3 cups cold milk. Whisk for 2 minutes or until well blended. Fold in whipped topping. 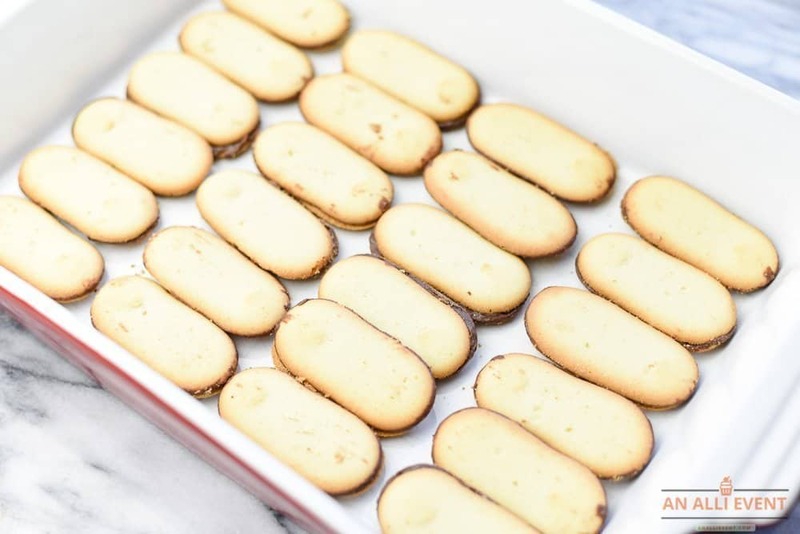 In a 9×13 pan, place a single layer of Milano cookies. Pour the vanilla pudding mixture over the cookies. Top with another layer of Milano cookies. That’s it! Store in the fridge overnight. Right before serving, drizzle chocolate syrup over the top of the dessert. In a large bowl, whisk the pudding and milk together for 2 minutes. Fold in the whipped topping. 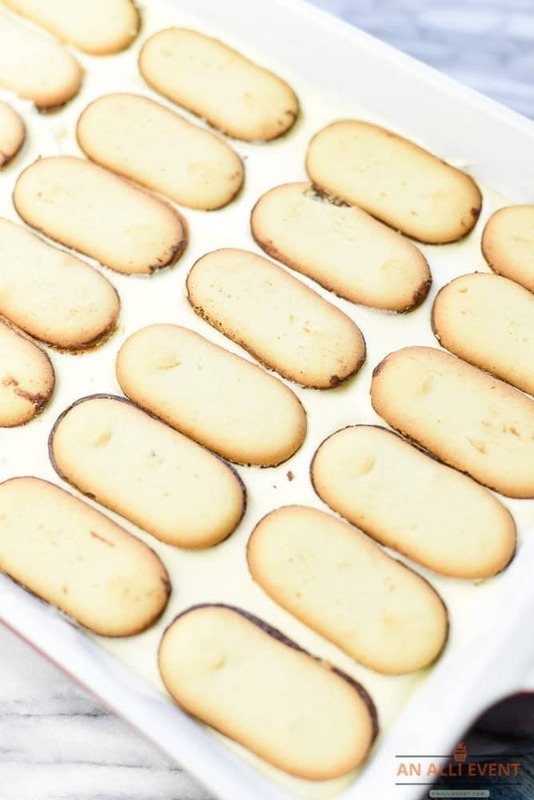 Place a layer of Milano cookies in the bottom of a 9x13 pan. Pour the vanilla pudding mixture over the layer of cookies. Top the pudding with a layer of cookies. Just before serving, drizzle chocolate syrup over the top of the cookies. The family declares this dessert a winner and it’s unbelievably easy to put together. The cookies don’t get soggy at all. One of my grandkids doesn’t care for chocolate (big eye roll insert) and he loved this dessert. It’s not overly sweet and has just the right amount of chocolate. Did I mention how easy it is to make? Well all I have to pick up to make this dish is the milano cookies. Piece of cake or should I say cookie. Love the no bake part of course. Looks really good. Oh my gosh this is totally heaven to me. 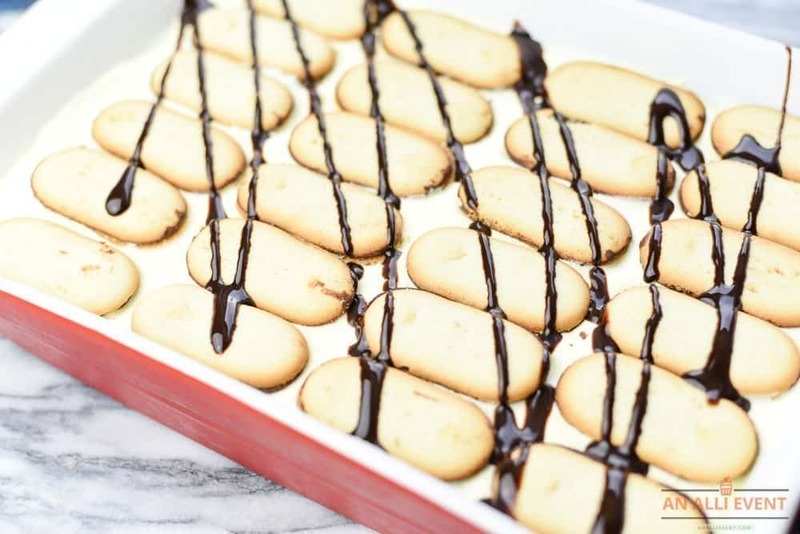 Milano cookies are probably my favorite type of cookies in the first place and putting it into a dessert like this I will be all over it. Do I have to share it? LOL. Oh my gosh, yes. I just LOVE Milano cookies. I’m going to make this dessert soon. Most of my family are huge fans of Milano cookies, so this will be gobbled up. I am so making this! I have a great fondness for the mint Milanos. I think it would be a great dessert! Thanks for sharing this recipe, I’m sure it will be wonderful! I’m always looking for yummy summer recipes. I love that this recipe is no bake and it looks like it super easy to make. I make a similar dessert for church potlucks and it is devoured every time! I will have to try it with the cookie addition the next time I make it. I don’t want to retell your recipe but evey ingredient is my favorite. I know my kids will love this and it could also be great for a party. I am all for no bake desserts. I’m going to try and make these for sure. Milanos are one of my favorite things in the entire world! I am going to have to try this out ASAP! Oh this looks so good! I love eclairs and this is a great way to eat them! This dessert looks really good and the best part is that you don’t have to bake it! It’s definitely something I’ll enjoy especially on a lazy afternoon with my fave cup of tea! I’m totally keeping the recipe! I love finding easy desserts! These look absolutely delicious, and with only two ingredients even I can’t mess it up! Milano cookies are so yummy, aren’t they? This looks like a delicious dessert. I love Milano cookies so I am sure I would enjoy this. Oh my this looks amazing. i love that its no bake too. Therefore I cannot mess it up and its quick! My kind of dessert. This will not stick around for very long at my house! My kids would devour these. Those are my favorite cookies! I can’t wait to make this. These look so tasty! I bet my daughter would love to make these and eat them all up.